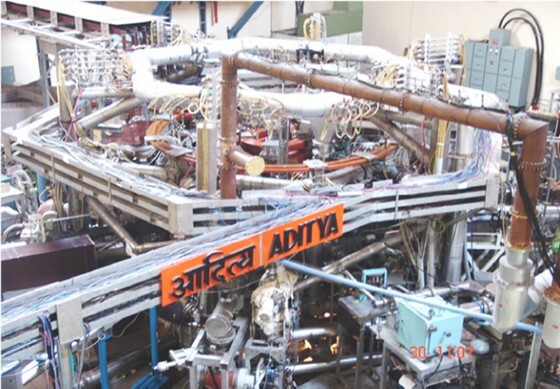 ADITYA (hindi word meaning SUN) is the first indigenously designed and built tokamak of India. Plasma discharges at toroidal field of 8.0 kG for nearly 100ms time with 80 - 100kA current, are being regularly studied in this little replica of SUN. To increase the plasma energy content during the discharge, auxiliary heating systems have been integrated. A 20 - 40 MHz, 200 KW Ion Cyclotron Resonance Heating (ICRH) system has been integrated to ADITYA vacuum vessel and successfully operated in the last campaign. A 28 GHz, 200 KW gyrotron based electron cyclotron resonance heating (ECRH) system has also been successfully commissioned on ADITYA tokamak. 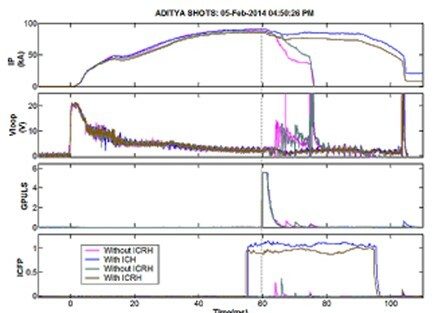 Some neural network analysis to predict disruptions and density limit on ADITYA have also been performed. This machine, an air-core, mid-sized (R=75 cm, a=25 cm) ohmically heated circular limiter tokamak, is engaged in carrying out several dedicated experiments on runaway mitiga-tion, disruption control etc. which are of utmost importance for the successful operation of large size tokamaks, such as ITER. 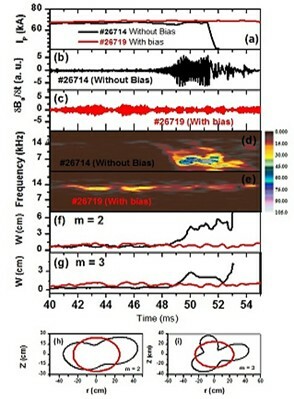 Analysing thoroughly the huge database of different types of spontaneous and deliberately-triggered disruptions from ADITYA tokamak, a significant contribution has been made to the international disruption database (ITPA).